The winners are in! Lulu and Roy chose 10 names from the entries in our special drawing on the bedroom floor! 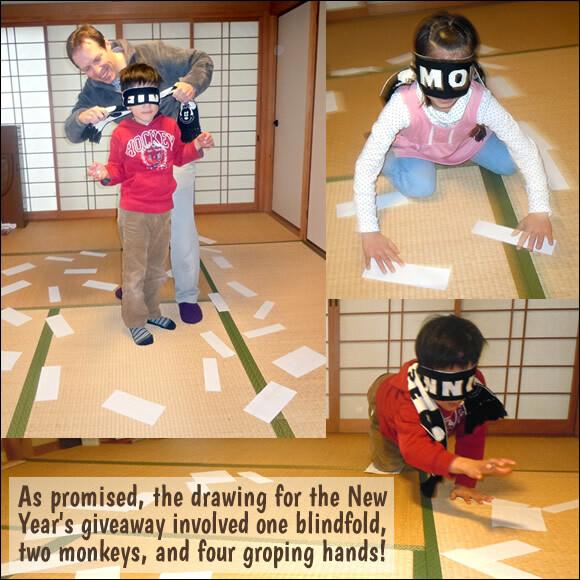 Afterward, though, as I was picking up the other entries, and again reading the heartfelt resolutions, I changed my mind about the drawing… Instead of 10 winners, I’ve decided to make everyone a winner! That’s right! Everyone who entered the giveaway and shared their “bilingual resolutions” for 2014 in the comments below will receive my “mysterious new resource” when it’s ready! The start of this new year is an ideal time for reflecting on the year behind us and resolving to strengthen our efforts in important ways over the year ahead. How did I do with my resolution in 2013? Well, I’d give myself a “B” (and I’m being kind). The truth is, I don’t always make the best use of my time. Over the course of the year, I squandered far too many hours through a lack of firm attention and commitment to my higher priorities. 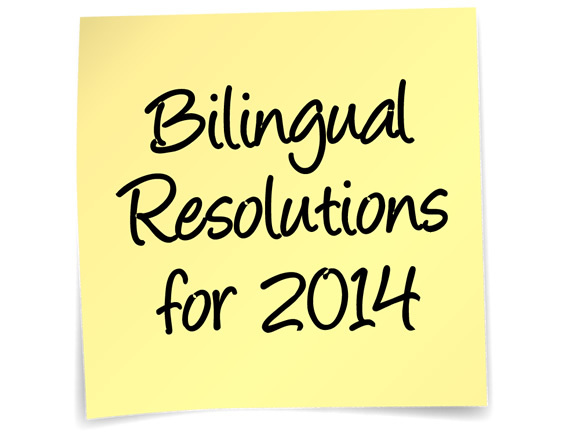 What, then, are my resolutions for 2014 in connection with my kids and their bilingual development? And what sort of prize can you win—there will be 10 winners!—for sharing some of your own resolutions in a comment below? No matter how you feel about the trite idea of “New Year’s Resolutions,” let me suggest that making conscious vows to strengthen your efforts when it comes to your children’s language development is always a good thing and should be a persistent part of your bilingual journey. In my case, blogging has come to serve this purpose well, as I’m continuously looking at aspects of my own journey that I might strengthen in certain ways, and then reporting on my experiences in these posts. Moreover, the fact that I do this quite publicly makes me feel far more accountable for my action (or lack of action!) than I otherwise would if I was simply declaring my intentions privately. And because I feel more accountable, I work harder at this aim. If you’ve been following this blog, you already know that “seizing each day” is at the heart of the life I strive to lead, both as a person and as a parent of bilingual kids. At bottom, I believe that living a fulfilling life, and making solid progress on the bilingual journey, are tied to the same basic ideal: mindfully seizing each day and doing our best to make that day count when it comes to our higher priorities. The thing is, unless we happen to be a Zen master who fully inhabits the present moment, there’s always room for improvement in this quest to consciously command the day, and that’s certainly true in my case (as evidenced by my “B” in 2013). And so I resolve, for 2014, to make progress in this essential area (at least a “B+”), awaking each morning with one vital, single-minded thought: Seize the day. At this point, my children have become competent readers for their respective ages (9 and 6), and I continue to read aloud to them each morning in English, our minority language, and pursue “shared reading” with them later in the day (where we read other books, taking turns, page by page). Although I’m pleased with this routine, the fact that they attend a Japanese elementary school, and have a substantial amount of Japanese homework each day, leaves them with little time and energy for further, independent reading in English. However, I’ve experienced a recent breakthrough in this area by adding to our collection of graphic novels (comic books). In fact, Santa brought us a tall stack of graphic novels for Christmas, and my kids consumed them even more quickly than I expected. (I’ll devote a whole post to graphic novels soon.) My sense is, if I can keep a fresh supply of appealing books like these on our shelves, that even amid the busy school week they’ll probably be tempted to pick them up. And so I resolve, for 2014, to continually seek out good graphic novels that can move my kids to read more in the minority language. While my first resolution reflects what I see as the bedrock for long-term success on the bilingual journey—one’s spirit—my second resolution concerns the practical level of strategies and resources, which naturally also demands our attention. To my mind, our most effective efforts are a strong marriage of these two realms: our spirit and our practical actions. 1) Now that my mom has Skype, arrange a regular (ideally weekly) Skype chat between my daughter and her grandmother. 2) Get the Dad to agree to spend another summer holiday in Germany and maximize daughter’s exposure to monolingual German kids there, to prepare her for the admission interview of the bilingual school. 1) For Girl1 I plan to focus on grammar and literacy this year. My goal for her was to be able to use Russian comfortably. She achieved it this past August and since then we’ve been slacking off. Time to get back in gear and not only speak comfortably but also correctly. She also has started reading in Russian so I think this year is the year we’ll try to establish a habit of daily shared reading. 2) Girl2 has been neglected I fear. I haven’t found time to give her individual attention and quality Russian interaction she deserves. So for her I think the key will be figuring out fun games/lessons we can do with Girl1 involvement so that I don’t have to constantly bounce my attention between the two. 3) My stretch goal, because everyone needs a stretch goal is to see if I can produce easy reader books of my own that Girl1 would be able to read. Russian early readers seem to lack Disney princesses and ballerinas which seems to be the only thing holding her attention. This year I want to find a way to make my kids listen to me while I’m reading aloud. I thought something even funnier of what I’m already trying. I play rolling, jumping, and catch me if you can. They agree eating healthy food. They watch Disney cartoons. They listen to English songs at home and driving. They even listen to stories in the car. But I will perform a real funny show every time I will read their books, with funny outfits and dancing and singing. They are always running around and they never sit quiet. I will save money to go to Great Britain, maybe at Peppa Pig Fun Park so they will be surrounded by English kids. 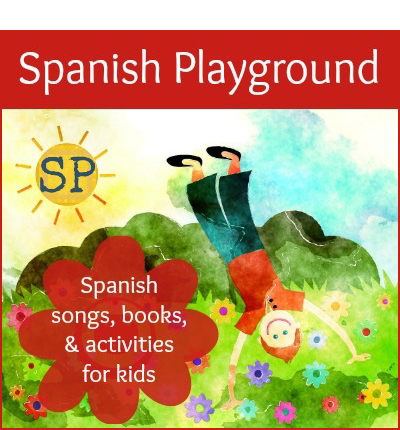 Spanish to the kids and of course play with them. There are so many things I would like to do but I’m waiting till they will start reading and writing. Of course, I will put some more Spanish day by day. The last thing, I will force my boyfriend to help me in this journey and I think this will be the most difficult task. I will continue to read to my children every night in the three different languages. 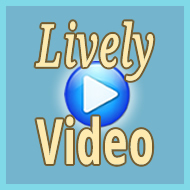 We will continue watching videos as well. My friends were kind to get us some new books for Christmas! I plan to change nannies (since I work full time and am a single mom) and hope to find one who speaks mostly in French to them (vs Arabic, I don’t want to get that in the mix right now). They already attend a French-speaking daycare in the mornings. 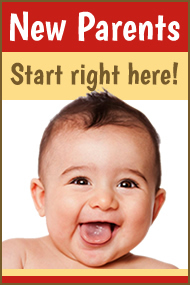 We plan to attend more playgroup dates with English speaking babies from the US Embassy. Skype more (in Spanish) with grandma and aunties/uncles. I like your idea of taping myself reading stories or singing songs to them. I will do that so that they can be played by the nanny while I am not at home. 1. Read aloud books appropriate to each child every day. 2. Teach my son to read in Spanish. 3. 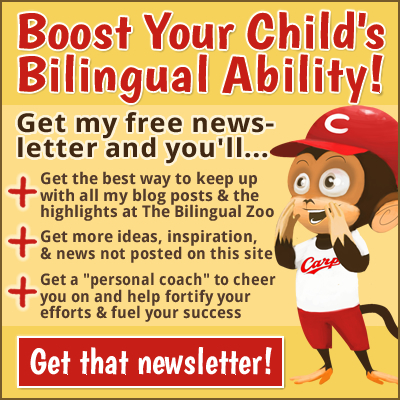 Read more about bilingualism. I have in fact a goal of reading all the posts of your blog, making notes on what ideas I would like to implement for our family and how we will implement them. I have already started and for example from the idea on how you cloned yourself reading stories for your children I have decided I will do an audio CD for our car trips where the whole Spanish family reads stories or poems they liked from their childhood for my children. I have already shared the idea with my family in Spain and they are all really excited about it. 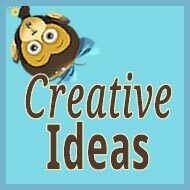 Keep the good work, I love your blog and I find it really helpful. Last year I started trying harder to encourage my kids to read a little several times a week. I resolve to double my efforts this year. I’ll prepare more reading material, and try to establish a 20-minute silent reading time for the whole family after dinner each evening. This year, I resolve to read more with my kids. I prepared for this by stocking up on English books at the thrift stores while I was home, and I’m making a more conscious effort to take the time to read with them more often, in the hopes of getting them more interested in reading in English on their own as well. I’ll be looking forward to your next graphic novel post, because my 8 year old particularly liked the series of graphic novels I picked up for him. Secondly, I’m redoubling my efforts to speak English daily at home and encouraging my husband to do the same. Since I’ve always spoken French with my husband, it’s second nature to fall back into French, lazily. But we have so few English speakers around, I need to keep the English going at home! 1. To follow with higher commitment and more consistency all the beautiful hints and great suggestions of a very interesting blog I have found called “Bilingual Monkeys”, I do not know if you are familiar with it… It is a source of inspiration, creativity and, last but not least, it is fun to read: no risk to get bored when reading it because the writer keeps it enjoyable with his sense of humor. 2. 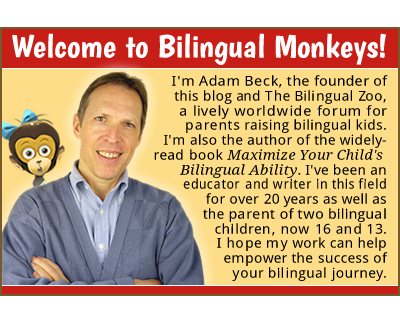 To stop only envy a certain guy called Adam Beck for how perfect he is (at least in my eyes) and how great his bilingual kids do and start thinking with more confidence that I could reach some good goals with my kids as well! All I need to do is to keep in mind this guy’s tips and stay focused on bilingualism (maybe a little less house cleaning and longer “kids time” will help!). 1. Ensure that our daughter has opportunities each day to read books written in both languages. 3. Expose our son to songs in both languages. 4. Continue having one of us speak only English to the children, the other speak only Japanese. 1. Since we are about to move to Germany, the kids will be losing their natural English speaking environment, made up of the expat community in Tanzania. Until I spoke German most of the times, but halfheartedly tried to enforce the rule to speak English whenever I was home alone with the kids. However, whenever I was tired or stressed or the kids were tired or stressed I turned back to German. My husband speaks Plautdietsch with them at all times. One of my resolutions therefore is to really enforce the rule of “English whenever home alone”, which means no matter if someone is tired or stressed or whatever. 2. I really want to put into practice the idea of “captive reading” you mention so often in your posts (in German – they haven’t started reading English yet). Once we are settled in Germany, I want to regularly put up notes in the bathroom for the kids to read, lie out books within view of the kids during rest time, writing notes to the kids or anything else I can think of. 2) make my girl speak Breton at school with other pupils learning this language (I’m her teacher!). Year 2014 will be in a way a transitional year for our son from predominantly home environment with exposure to English from me to the big world outside and a kindergarten in particular. As places with English speaking environment are really scarce in Belarus my resolution is to find and create as many opportunities as I can for my son to practice his English outside home while continuing to do my best at home. 1) Weekly contact with grandma back in Spain so kids can talk to her (now is every 2 weeks). 2) Continue with our reading out loud work and even increasing the time so I would also have the chance to read out loud in both languages (now is about 90% Spanish and 10% Dutch). We read around 30-45 minutes a day. 3) From August on, my kids will start reading at school in Dutch. I want to introduce reading to them in Spanish at the same time so I need to prepare some material to be ready for that moment. Thanks, Adam, for your blog. I really enjoy it. Resolution for 2014 as a mother of trilingual children. However, I have decided that in 2014, I will write more in my blog. Share more with everybody about what I do and can do to help (I have many tools, many advices and I can also help bilingual families when one the child has dyslexia or any other problems.) So why keep it for me??? Reaching out to more people than just the small group around me is important to me. It is a huge work, a huge resolution, but I will be committed to it!! As for my own family, my kids are teenagers and fully trilingual—they have no trouble learning new languages at school and outside school. Great job and they are so happy to be able to speak with so many people around the world. 1) I definitely want to use more bilingual songs in the car. 2) We will try simple literacy based worksheets in the target language. 1. 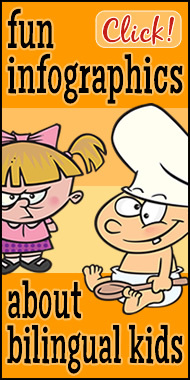 Create a comprehensive youtube playlist with age appropriate French cartoons that have already been uploaded for when she is a bit older. 2. 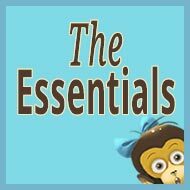 Create playlists on my iPhone of French lullabies and nursery rhymes for easy access during feeding and playtimes. 3. Organize the French books that I already have by level and start to seek out more for purchase on ebay. 1. Speak German at home more consistently! I demand this of my children, but since I spend the whole day at work in an English-speaking environment, I come home and mix a lot of English in… Stop doing that! 2. Seek out German friends or groups for my children to have German peers. And of course continue to do literacy in both languages with the 4yo and take them both to Germany for the summer! I left you a message on FB. Maybe since I’m in Fort Worth, Texas our paths will cross. I look forward to reading your book and learning from your experiences. 2014? Easy! Spending more time with my child while he develops his language! Attending French toddler class, reading good bilingual books like Be Bilingual and keep up to speed with Bilingual Monkeys! Also, deciding on a long term strategy with schooling and languages. Vast programme! In 2014, I plan to take my own Mandarin class to catch up with the 4 yr old. We will return to practicing Mandarin more each day starting with breakfast. I have found a few communities where we can have more exposure and interactions with native speakers. I will schedule time for this at least twice a month. 1) Give my son more opportunities of Japanese outside home. I’m the only one Japanese input at home, and my son is always surrounded by his father and his family who speak English. So, English already seems dominant than Japanese. I want him to have a solid foundation of his bilingual journey, so I think he needs more Japanese input. Start from going to Japanese play group, seeing my Japanese friends and doing more Skype with my family in Japan. We live in a rural area, so we don’t have much access to Japanese book collection like in a big city, where there’s big library or book store with many Japanese books. I started monthly picture book delivery from Japan for my son. It’s so exciting! Healthy body has healthy brain… Now that he started walking, it would be nice to go out and play in the sun more often. For this year my resolution (dream!) is to take my children to Spain in June when school is over in Italy but not yet in Spain, and make them go to school in Spain for a couple of weeks as auditors. If they like it and if they feel ok I would love to take them also to a summer camp in Madrid to make them play with other kids. All the rest of the year I make a resolution to go on teaching my first two kids English and German while speaking Spanish to relax and to communicate all the time we are with the youngest. Sounds like a mess but it will eventually work! Our resolutions are to write to our family in Bolivia more and consistently speak Spanish at home. For my four year old, I’d like him to learn a new kid song in Spanish each week or two. We don’t sing enough songs. 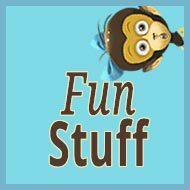 I just stumbled upon your blog and love it! Thank you so much for all the ideas! Looking forward to reading more! —Be very consequent with the use of each language and don’t mix them. Concentrate on speaking always Catalan when we are alone and English when the father is there. No German at all only to be polite to the people around us on the street. 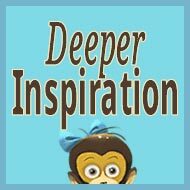 Adam, thanks again for your blog, it is such an inspiring reading! Another, more concrete, thing I would like to start is regular Skype conversations with my parents in America, so that their granddaughter knows them and has more access to spoken English from various sources. 1) continue to speak in Portuguese only with both girls. 2) stop speaking in English with husband. Use Portuguese, and when he can’t understand use Spanish. 3) start video chatting with family and friends in Brazil, hopefully have a long vacation there this year. 5) once she is a little bit older, get her a pen pal. I have lots of friends that have kids her age. 2. 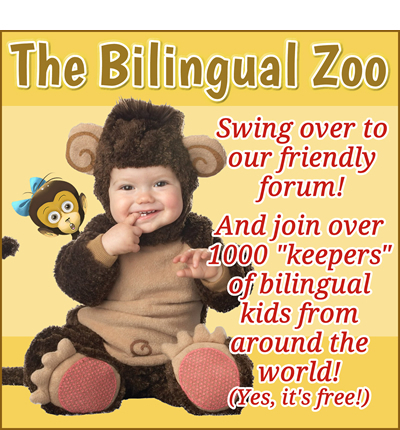 Speak in Spanish with my children in public more, like at the zoo for a field trip. This is odd for me because I am blonde, so I do not look like most Spanish-speakers in Texas. But, who cares?! People look at me funny, but I should get over that. My husband does not speak Spanish either, but I should still commit to speak the minority language with my children in his presence. He can learn! 3. Introduce my children to Korean through some fun DVDs and curriculum I bought. I do not expect us to become fluent, but to have a basic knowledge of the language. They need to know how diverse and rich languages are. Not all use the Roman alphabet—imagine that! This is breaking news for those of us in Texas, USA where the world certainly revolves around us! I’d love to expose them to more bilingual books in English and languages other than Spanish. Suggestions? Tweet me: @drmandystewart. 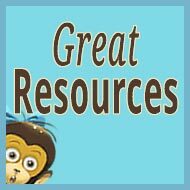 I’d love to learn about books you love to read your bilingual monkeys! Previous post: Hey, Guys! The Holidays Are Over!